Fenugreek leaves or methi leaves are very good for health as they are rich in antioxidant, iron and also a good source of dietary fiber. It also has vitamin C, thiamine, riboflavin, vitamin B6, calcium, magnesium, potassium and selenium. It is beneficial to diabetic patients and also helps to alleviate the symptoms of both menstruation and menopause. In short fenugreek has numerous health benefits which can help in overall well being. So try to include it in your diet at least once in a week.Today we will learn how to make Methi Paratha (2 methods) following our easy recipe. 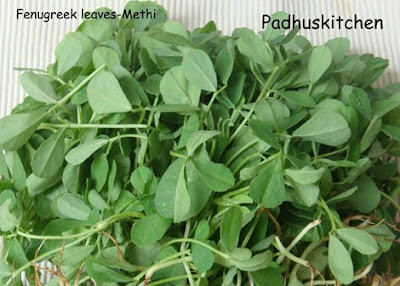 1.Wash methi leaves and drain the water. Chop it finely. 2.Mix wheat flour, methi leaves, red chilli powder, turmeric powder, jeera/cumin seeds, salt and 2 tbsp of oil together. 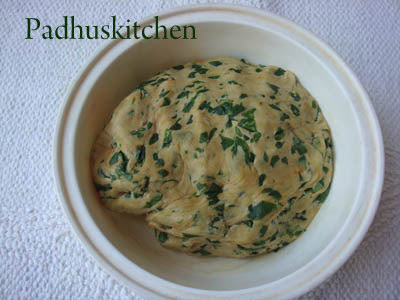 Add water little at a time and make a soft dough as shown in the picture below. Cover it and let it sit for 1 hour. 3.Now make equal sized balls out of it and roll the balls dusting a little flour into round shaped chapati with a rolling pin. 4.Heat a tawa and place the rolled out dough on it and cook for a minute.When bubbles start appearing, apply a little oil and flip it over to the other side. Let the other side also get cooked well. 5.Apply a little ghee and serve it with lemon pickle or curd or raita or chutney or any side dish of your choice. Heat oil in a pan, add jeera seeds, when it splutters, add finely chopped onions. Saute until onions turn pink. Add ginger garlic paste and saute until the raw flavor goes. Then add finely chopped methi leaves, all the spice powder, little salt and cook on medium flame until the methi leaves wilt. (see picture below). You do not have to add water for cooking the leaves. If required, add 1-2 tbsp of water. Leave it to cool. Roll out the dough just like chapati. Heat a tawa and cook both sides until brown specks appear (follow the same procedures mentioned in method 1 for cooking the parathas). Apply a little ghee or butter and serve with curd, pickle or chutney. Note - It will stay soft even hours later if you keep it wrapped in a soft cotton cloth. yummy and healthy paratha...looks so lovely. Mouthwatering paratha..love them with tea ! Love methi Parathas..Healthy and nutritious....Beautiful presentation.. I love methi paratha, Yumm! How are you? I love methi paratha and this is the season. Today I am going to make the other variation i.e stuffing the methi leaf mix in the paratha . darn! I had methi at home last night which I made into dal. I should have used it to make this parathas. Looks so good. 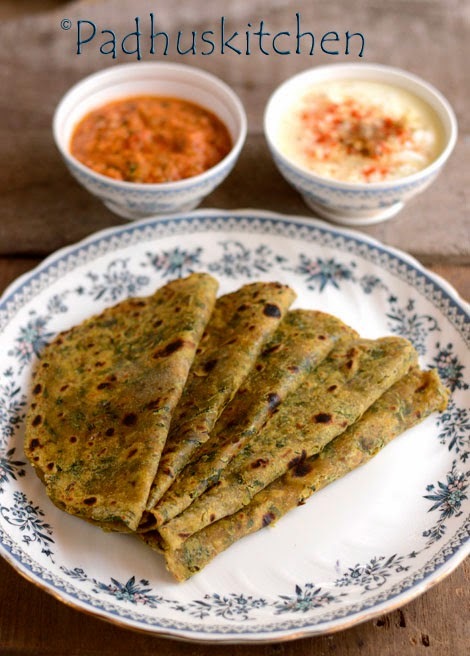 I just love the flavours of methi in all dish, lovely parathas. Parathas look lipsmackingly yummy. Would love to try out your recipe soon. Methi paratha looks delicious. Love methi paratha. looks delicious! the plate looks very inviting. Delicious paratha Padhu! I love the flavour of methi so much that I try to use it as much as I can and it is healthy too! Regarding your question in my blog, yes you can post it without logo, if you give a link to the event that would be fine. yummylecious paratha..padhu...superb...love to know abt the recipe of aaloo paratha also.. Healthy and flavorful parathas, thanks for sharing. Yes, this paratha is one of my favourite. It is good to add curd while making the dough which will enhance the taste of paratha a lot. Hi, Thanks for the recipe. It came out very good. My family loved it! Yes, you can make like my aloo paratha but the stuffing should be very dry with no moisture. Otherwise you will have difficulty rolling the parathas. Very nice...:) I tried n it came out well n it was tasty:) thanq! Can we prepare this dough previous nyt,keep it in fridge and use it the following morning for breakfast?? Yes, you can but bring it to room temperature before making parathas.